2 Who tweeted in what language? For a bit of a context on the IRA’s activities and the Russian Influence Operation in general, Mashable offers a nice overview. The IRA zip alone is 1.24 GB big! Let’s dive in and explore. Before we can start with any analysis, automated or not, we have to inspect and prepare the data - remember: EDA FTW! Anyways, a dataset of this size is a perfect exercise in data wrangling and exploratory analysis with tools from the galactic tidyverse. So what I’m aiming to highlight with this post, is my more or less systematic approach to turning an granular dataset with millions of observations into something more useful (and reliable!) for further in-depth analysis. First, we need to unpack the .zip file and then read the .csv file into R.
data.table is by light years the fastest method, but read_csv() gives me NA’s without an extra hassle while data.table::fread() seems to be ignoring any patterns for na.strings. Therefore I’ll be working with the data object from read_csv() here. Since read_csv() is rather slow with a CSV this big, you can speed up your exploration if you save the data object as an .rds or .RData file. With a dataset this big, skimr::skim() is just perfect (and it’s output much more functional in RStudio)! The IRA dataset consist of 1.899.595 9.041.308 Tweets in 51 58 languages, from 3.460 3.667 unique accounts and 11 account languages. That’s pretty “diverse” but also quite complex. There’s 1.899.595 9.041.308 observations for $tweet_text, but only 1.634.942 6.598.905 are unique. This huge delta just screams: spam bots and/or coordinated campaigns! we can see from $retweet_userid that apparently, 703.467 3.333.184 Tweets are just Retweets and not unique/original Tweets. there are 608 unique account locations (shared by an unknown number of those 3.667 accounts at this point), and there are 4.779 geolocated Tweets. That’s not much, but we could try to double-check these locations with the respective $account_language values. That should give us enough leads for an initial inquiry. Let’s continue with the data preparation and address what we have discovered so far. Ok, now we know that 3.333.184 (~1/3) Tweets are Retweets (of 1.725.841 unique Tweets). Good to know for any Natural Language Processing Method which depends on statistics, i.e. Topic Modelling, or when building a corpus for descriptive analyses. It’s probably more efficient to remove duplicates as the first step. This reduces the data object we’re working with. Now we’re down to 5707611 unique Tweets in 57 Tweet languages by 3548 Users with 11 account languages. That’s quite a lot, even if we only consider Tweet languages with n > 1000 Tweets. We need to reduce the scope of Tweet languages for now. 5000 is only slightly less than 1% of the unique Tweets, so this sounds like a good threshold. # I'm very sure that there's a more elegant solution for mutating observations row-wise based on grouped counts... However, whatever works, works. We’re down to 13 language categories for the Tweets. That’s far better! So there’s 11 account languages. I’m going to focus on languages with n > 100 accounts, and recode the rest as “other_6” (since we can assume “uk” == “en-gb”, that’s one language less). Great! Now we’re down to 5 account languages. Let’s see how many different languages we have by now. ##   "ru"       "bg"       "en"       "und"      "other_44" "de"
##   "uk"       "tl"       "es"       "ar"       "fr"       "in"
Now let’s create a preliminary overview. 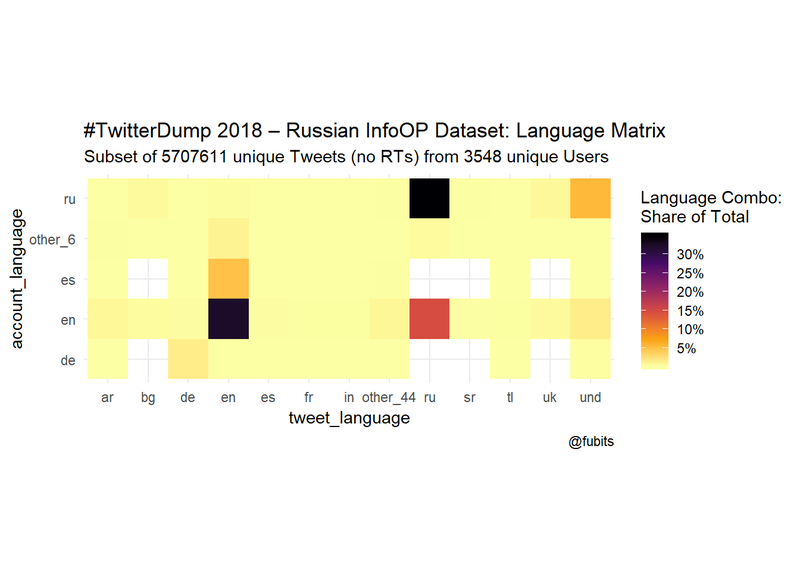 caption = "#TwitterDump 2018 – Russian InfoOP Dataset: Languages (unique Tweets)"
That’s already interesting, but let’s not jump to conclusion about who tweeted in what language, yet… This summary alone does enable us to claim that, for instance, Russian accounts where responsible for all the Russian Tweets, and so on. 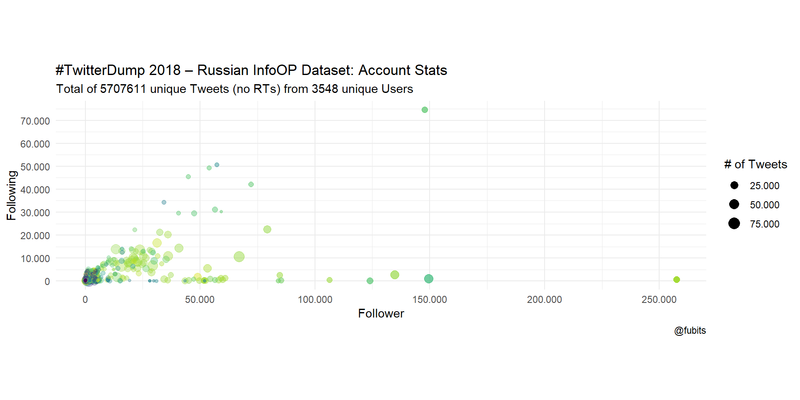 What’s really striking is that 50% of the Tweets from this 9M Tweets IRA dataset are in Russian (or at least labelled as such), which does not quite fit the dominant narrative of a solely US-centric information operation. 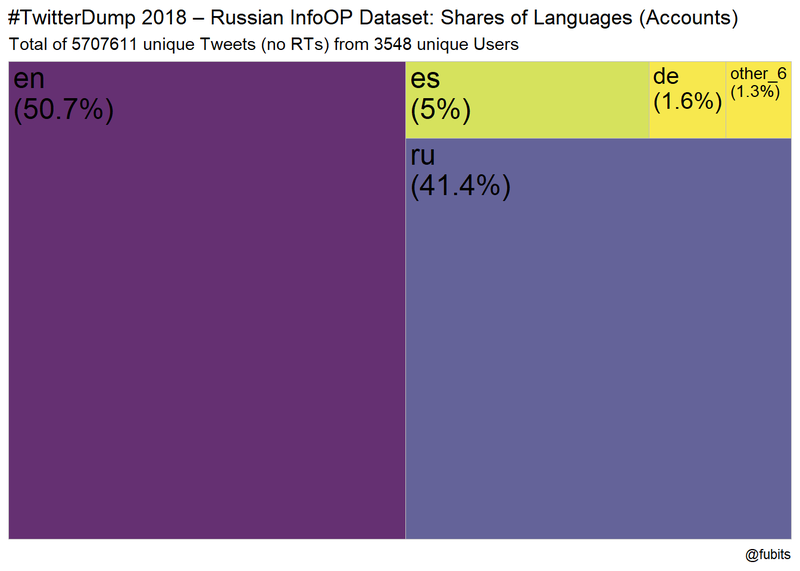 These numbers show that Russia’s activities were concered with Russian-speaking people as much as with an English-speaking audience (among German and Spanish). That’s great news so far! Since we’ve reduced our dataset and already recoded the NAs, this step is not necessary anymore (before that, I worked without is_retweet == FALSE and things looked a bit different). However, I’m just leaving the syntax here, since it might be useful to others (and to myself). Now it’s about time to look into which account language groups tweeted in what languages. This is also a good moment to create language-specific or other intereting subsets from our refined dataset. 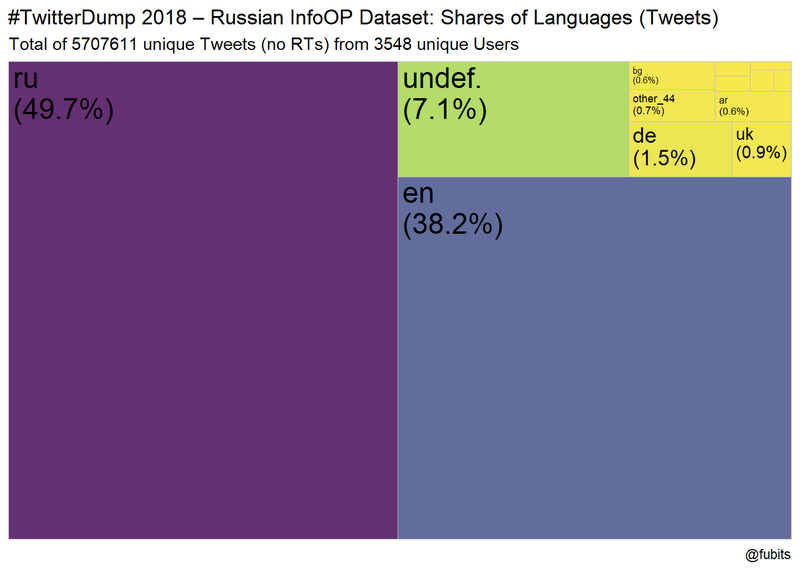 The German subset has 98064 Tweets by 782 users. The undefined (“und” & “NA”) subset has 404557 Tweets by 2867 users. Now the $Tweet_Langs var contains a list of all Tweet Languages from every single Tweet posted by an Account. Compare the number of $Tweets with the length of the vector (in the list) further below. For $Tweet_Langs_Counts, we have utilized the quite elegant forcats::fct_count() which gives us a list of the aggregated language counts. I’ll get back to this in a minute. Let’s now visualize the general characteristics of all accounts in the IRA dataset. alpha = "Alpha: # Retweets"
From what we can see here, we have quite an amount of “influencers” - accounts with lots of followers and low rates of following others. What if we look at the account languages? And now let’s just look at when the most influential accounts were created. 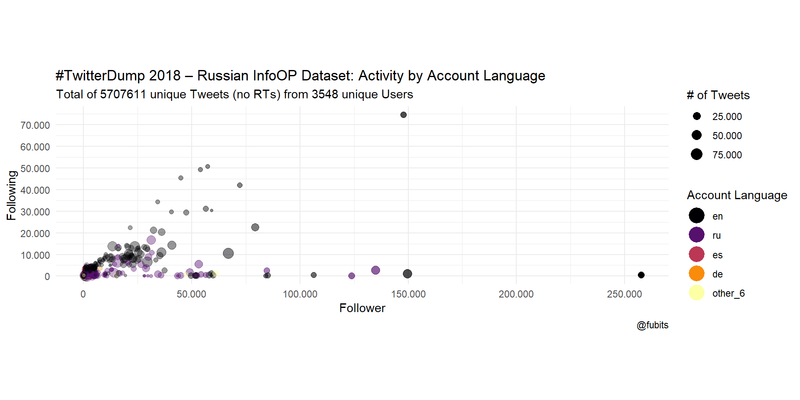 Interesting, one of the most influential accounts is neither Russian nor English-speaking! 2518710111 is not hashed :) Let’s find out who this is! “Вестник Новосибирска” - Newspaper of Novosibirsk - doesn’t sound too British :) the account has been suspended by Twitter, btw. What about accounts with the most Tweets? 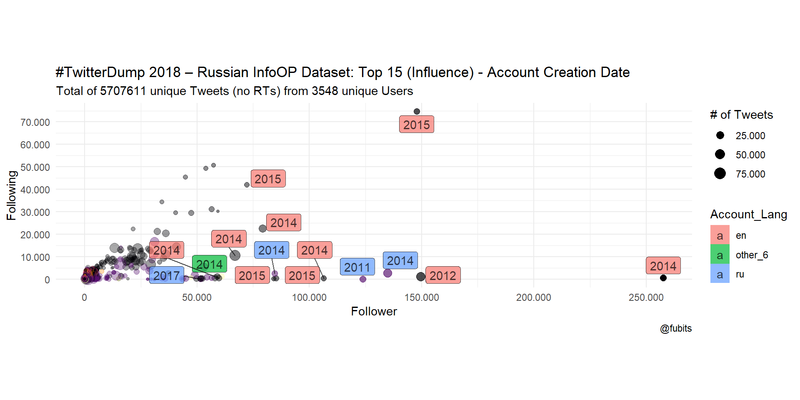 We can see from both plots that the most influential or active accounts were created in 2014 or later, and that the relation between Russian- and English-labelled accounts is rather balanced in terms of max. Tweet numbers. However, English-speaking accounts are more dominant in terms of numeric dominance (Following/Followers). Now it’s time to have look at the account language to tweet languages relations. Now let’s visualize all the 57 Account Language -> Tweet Language combinations. 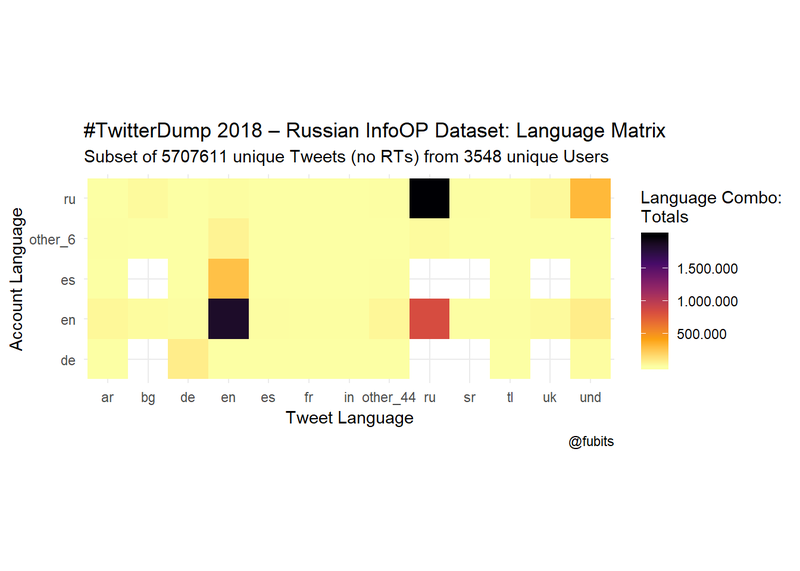 For an easier understanding of these plots, just keep in mind that Tweets are posted by accounts, so the Tweet language (bottom) is our dependent variable here. fill = "Language Combo:\nShare of Total"
@stratosathens Strat, Every time we are in the state of burning chemical plants! Why is it happened with us?! Btw, have you already discovered the US-Republican-sponsored (sic!) 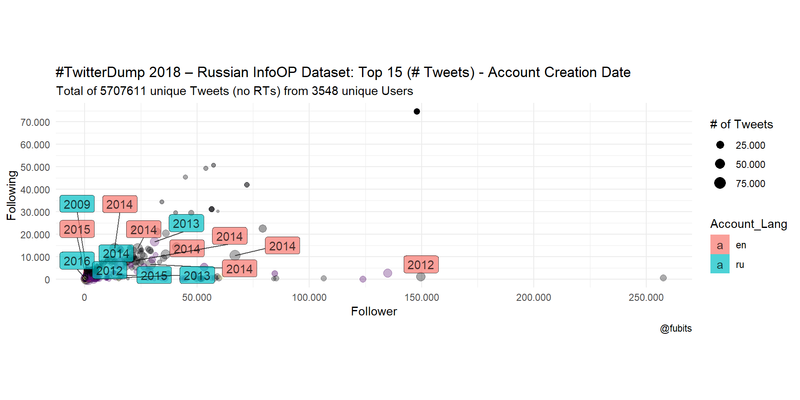 RussiaTweets.com Project?